snowdeal.org > ex machina: organic tomatoes - tasty and full of flavonoids. organic tomatoes - tasty and full of flavonoids. fans of organic farming have long maintained that organic farming practices produce a healthier soil and healthy soil yields tastier and healthier foods. but scientific data to support the healthier part of the claim has for the most part been lacking. 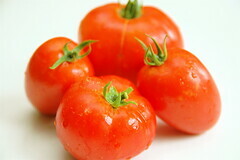 however, a recent issue of the acs’ journal of agricultural and food chemistry published the results of a ten-year comparison of the influence of organic and conventional crop management practices on the content of flavonoids in tomatoes which found that organic tomatoes have almost twice the quantity of antioxidants (called flavonoids) that help to prevent high blood pressure and strokes. the UK-based soil association has long touted the results from a study that showed that UK-grown produce has shown a 12 to 76 per cent drop in important nutrients over the past 50 years, a fact that they theorize is related ot the rise of "conventional" farming practices so i wouldn't be surprised to see more data soon on the health benefits of eating food grown in healthy soil.